← Applying the Equation of Time when calculating longitude at the Sun’s Meridian Passage. Part 3 – Calculating Altitude and Azimuth at the Assumed Position by Spherical Trigonometry. There are several ways of calculating the azimuth and altitude at the assumed position; these include the use of sight reduction methods and software solutions. However, the traditional method is by the use of spherical trigonometry which is demonstrated below. PZ is the angular distance from the Celestial North Pole to the zenith of the observer and is equal to 90o – Lat. PX is the angular distance from the Celestial North Pole to the celestial body and is equal to 90o – Dec.
ZX is the Zenith Distance and is equal to 90o – altitude. The angle ZPX is equal to the Local Hour Angle of the Celestial Body with respect to the observer’s meridian. The angle PZX is the azimuth of the body with respect to the observer’s meridian. PX = 90o – Dec.
PZ = 90o – Lat. ZX = 90o – Alt. In order to calculate the azimuth and altitude of a celestial body we must solve the triangle PZX in the diagram above. Specifically, we must calculate the angular distance of side ZX so that we can find the altitude and we must calculate the angle PZX so that we can find the azimuth. However, because the triangle PZX is on the surface of an imaginary sphere, we cannot solve this triangle by the use of ‘straight line trigonometry’; instead we must resort to the use of ‘spherical trigonometry’ which is explained here. 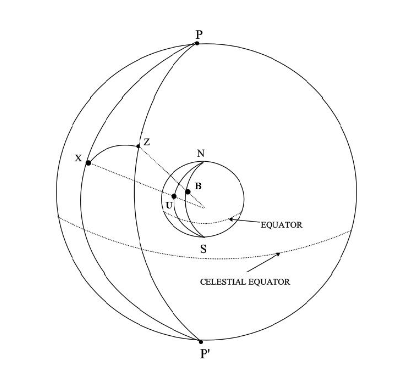 Example of the use of spherical trigonometry to calculate the azimuth and altitude of celestial bodies. Note. Traditionally, the ‘half-haversine’ formula was used for this task but this formula does not lend itself well to solution by electronic calulator; therefore, the following solutions involve the cosine formula. In terms of bearing, the azimuth is 348o. Please Note. This topic is explained in far greater depth in my books ‘Astro Navigation Demystified’ and ‘Celestial Navigation – The Ultimate Course’. The next post in this series will give a full example of calculating an astronomical position line. This entry was posted in astro navigation, Astro Navigation Topics, astronomy, celestial navigation, navigation and tagged astro navigation, astronomy, celestial navigation, celestial navigation training, navigation. Bookmark the permalink.